Pile your plate high: With ribs, salmon, and peach cobbler at Big Springs Gardens’ Friday and Saturday BBQs, set in manicured gardens beneath tall pines (Jun 11–Aug 28; from $37; book early; 530/862-1333). 1. 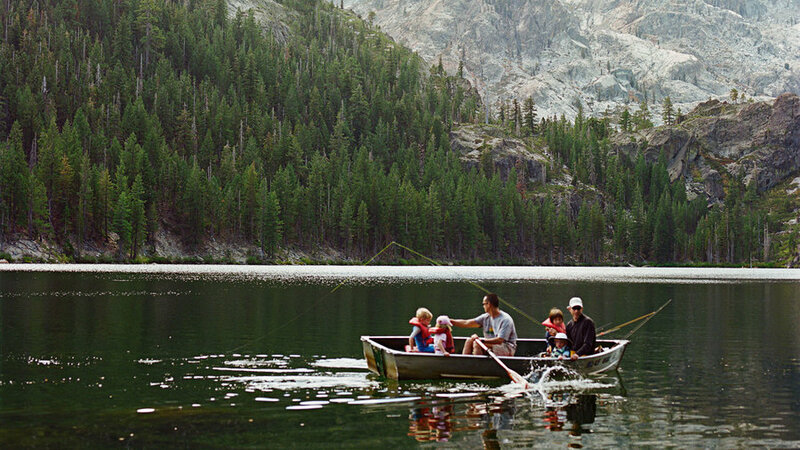 Float on a boat: Rent a rowboat ($30 per day) or a blissfully silent electric motorboat ($60 per day) to float below the Buttes on the Lakes Basin’s lovely Lower Sardine Lake, 15 minutes from Sierra City. Some fish, some doze, some launch their own kayaks and paddle off. The reward for a half-mile hike from here is perfect solitude at Upper Sardine Lake. Off Gold Lake Rd. 4. Walk among the wildflowers: In the Lakes Basin, Round Lake loop delivers bouquets of wildflowers—mountain lupine, Indian paintbrush, columbine. Plus, as you walk the 4 miles, you’ll arrive five separate times at a picture-perfect lake in a glacial basin with crystalline water to wash off the trail dust. From Gold Lake Lodge (off Gold Lake Rd. ), follow signs for Round Lake, then Silver Lake, Long Lake, Cub Lake, Little Bear Lake, and finally Big Bear Lake. 5. Make it a weekend: With a faintly alpine charm, Buttes Resort’s cottages are steps from everything in town. Pick a room with a deck above the river (4, 7, 9, 10, 11, or, our favorite, 12) for a view of pine-forested hillside. Most rooms have barbecues and kitchens. Leave the windows thrown open to catch the nighttime chorus of crickets and the river’s constant, gentle whoosh. From $85; two-night minimum.